What could be more romantic than arriving at your wedding in a beautiful Horse Drawn Wedding Carriage, decorated just for you. 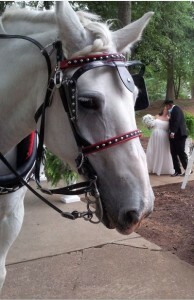 A gorgeous horse in parade harness with a formally dressed coachmen. The pictures and memories will last you a lifetime. 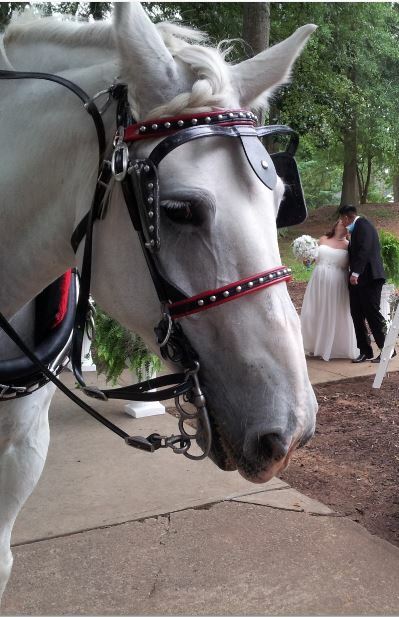 Southern Breezes Carriages will work with your venue, wedding planners and the bride to insure your event is perfect. If you want an amazing entrance to your ceremony or a quiet after ceremony romantic moment with your new spouse, we will make it special. After Reception drop off to your hotel is available as well. Please call 704-301-5111 to start planning your event.